This entry was posted in news on December 31, 2016 by wftufise. FISE, the World Federation of Teachers Union, expresses its deep condolences to the families of the 92 victims of the Plane Crash in Sochi, Russia. Among the passengers were dozens of the Red Army Choir, singers, dancers and orchestra members. A protest for the release of the Colombian trade unionist Huber de Jesús Ballesteros Gómez, who has been already in prison for three years for his political and trade union action and he will be on trial on Monday 19/12/2016, was held today by the World Federation of Teachers Union, FISE, member of the WFTU, at the embassy of Colombia, in Greece. FISE met Ms. Niki Arvanitis, the Secretary of the Consulate, talked with her and submitted a resolution for the defence of the trade unionist. At the same time, a protest was held by the World Federation of Trade Unions, WFTU and the All Workers Militant Front, PAME. This entry was posted in news on December 18, 2016 by wftufise. This entry was posted in news on December 7, 2016 by wftufise. FISE, World Federation of Teachers’ Unions, affiliated to WFTU expresses its solidarity and support to the workers and unions of PAME for the General Strike of December 8. This strike is a response to the brutal policy of the SYRIZA Government, which imposes new antilabour measures, further wage cuts and cuts in pensions, more flexible working relations, removes trade union rights and freedoms, attacks social security rights and imposes new brutal taxation to the workers and pensioners. On behalf of 92 million members of the WORLD FEDERATION OF TRADE UNIONS, I would like to convey to the cuban people,to the CTC, to the State and Party leadership of Socialist Cuba, our deepest condolences from the bottom of our hearts for the Comandante Fidel’s death. He was a leader who, along with Che, along with all his comrades, fought and beat the imperialists and their instruments. 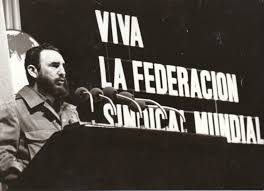 For the WFTU has been the greatest honor Comandante Fidel’s own presence in its Congresses and his great speech to the delegates of the 10th WFTU Congress. For the World Working Class will always be IMMORTAL. This entry was posted in news on December 3, 2016 by wftufise.